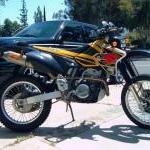 beniflas replied to Fargoin's topic in BAJA Info, Upcoming Baja Rides, Ride Reports, Baja PHOTOS, etc. Jim, thoughts and prayers going out to his family and to you. Not a whole lot....once a month if I'm lucky. Working nights and son's baseball keeps us busy. Thanks Jim. Sorry, the Ranger's a keeper.....for now......I have been thinking of something a little bigger with forward facing rear seats like a Tundra Xcab. 1 gallon Prestone bottle in an ammo dump pouch. Straps onto tool pack belt and also has a thigh strap..think drop down holster. That is a great deal. Anyone wanna buy my Delorme so I can upgrade? ? tntmo, have you tried contacting SpotX tech support? Hopefully this was just a one time deal. Hmmm, must be an SDAR thing. I did a baja ride with another member that got a flat as we were leaving Tecate. Tire had about three 1-inch gashes in it. We pulled into a llantera and found a tire iron inside the tire. I'll try to dig up the pic. remove all tire irons from tubeless system. oh well. Same here, buddy is looking for another option besides toyhauler or borrowing flatbeds. Pic taken at FUD? Can i get in line for the 6x14 trailer in case wildwood has a change of heart? Latest Comms Update But wait... there's more!